This annual free event is sponsored by the Hampton Beach Chamber of Commerce and is held at the Hampton Beach Seashell. See Miss Hampton Beach photos! If you have never been married and are a young woman between the ages of 16 and 24, you can enter the Miss Hampton Beach Pageant. In this competition, contestants are judged on personality, poise and appearance. During the daylong event, the young women go through three types of evaluations, starting with individual interviews by the 10 judges. These interviews are followed by a swimsuit competition and an evening gown competition. 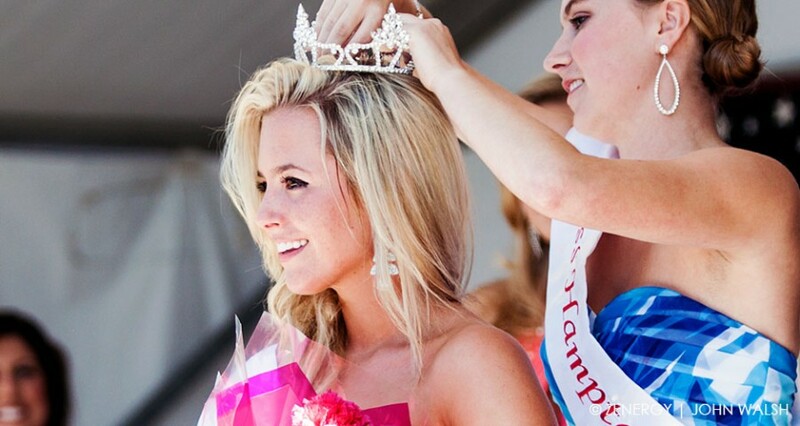 Cash awards include a $500 prize for being crowned Miss Hampton Beach. There are also cash prizes for first, second, third and fourth runners-up. Miss Congeniality, which is voted by the contestants, receives a trophy. There are also additional non-cash awards. Miss Hampton Beach is seen as being an ambassador for the Seacoast and represents the region at various events, including Hampton Beach’s Children’s Festival, Seafood Festival, Christmas Parade and Fourth of July celebration. The winner of this event may also enter the Miss New Hampshire Pageant. The Miss Hampton Beach Pageant, with its focus on building confidence in contestants and emphasis on collaborative interaction amongst the competitors, seeks to create a positive experience for all involved. Interested Contestants should contact Stephanie Lussier at 603-512-5257 (cell phone). Judging is based on appearance, poise and personality. Talent is not a requirement. Contestants will be interviewed individually by the judges, will compete in swimsuit and evening gown competition. Questions and on stage interviews will be completed by the finalist. Miss Hampton Beach will chosen by a panel of judges. Judging will be done on a modified point system with 10 points awarded for the girl that each judge feels should be first, nine for second, etc. After each round of competition, the judges, who will not discuss the pageant with each other once it has started, will have their individual sheets tallied by an independent party whose sole role is to tally the scores. Cash awards and trophies will be awarded to the top five finalists. Miss Hampton Beach will receive $500 cash; 1st runner-up $300; 2nd runner-up $200; and third and fourth runners-up receive $100 each. Miss Congeniality will be voted on by the contestants and will be awarded a trophy. Additional non-cash prizes will be listed at a later date. Each contestant will receive a souvenir Miss Hampton Beach T-shirt that will be worn during the opening number. Each contestant will need white shorts and white sneakers for that number. Try not to be nervous during the pageant. Past contestants have always told us that they had a lot of fun and enjoyed the experience. Relax and smile! Walk at a moderate pace. Whether you win or lose the title of Miss Hampton Beach, you will emerge better for the experience. You will develop self-confidence and poise by appearing on-stage at the pageant. Pageant personnel will be available to assist you with walking on-stage and feeling comfortable. Those without prior pageant experience will feel comfortable by the night of the pageant. You will find new ways of developing your personality and will walk away with some very good friends. Learn the valuable lesson of good sportsmanship by winning or losing graciously. Back-stage behavior should be supportive and friendly toward your fellow contestants. Remember you are all in this together. Most Importantly, it is a goal, that we not only select a Miss Hampton Beach that is a true ambassador for the NH Seacoast, but that each contestant walks away as a winner and has gained from the experience. Contestants would not be in this pageant if they were not already a winner in their own right. All contestants have our highest respect. We wish you good luck in the pageant and success in your future.